I am always so amazed at how music educators are able to collaborate through blogs, Pinterest, and Facebook. All of these provide a great platform for sharing ideas and professional development. I know that is can be difficult to grow professionally when you are the only music teacher in your building and you don't have anyone "in house" to share ideas with, where as each grade level has a team of teachers to share ideas. It can be very lonely and leave you feeling a bit isolated. I think that is why (good) music teachers go out of their way to soak up as much professional development as they can. They give up their Saturdays to go to workshops, they attend professional conventions, they take graduate classes. I love the online community of music teachers I have found and gotten to know through blogging, Facebook, TPT and Pinterest. 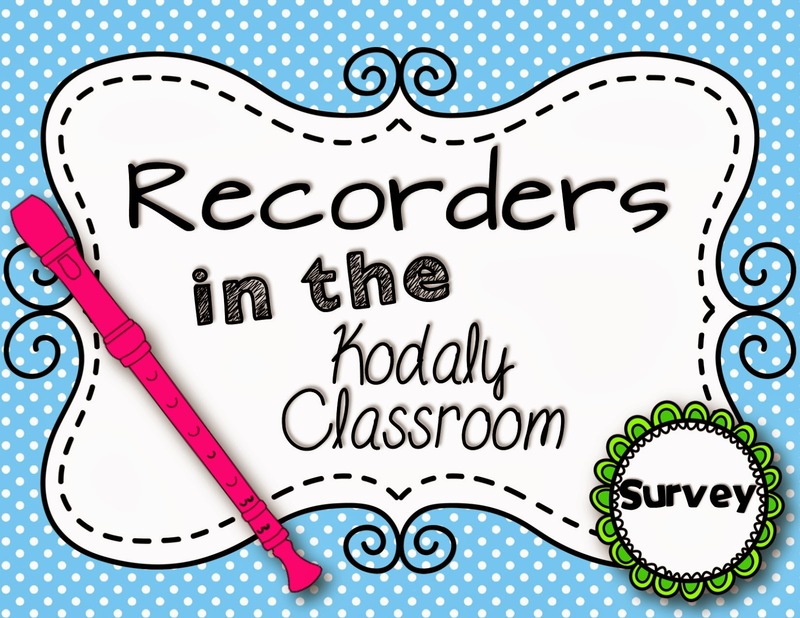 I was recently approached by another Kodaly teacher about promoting a survey she is doing to collect data on the use of recorders in elementary music. Taking her survey really made me think back on my own experiences with recorders. I COULD NOT figure out the whole fingerings thing when I was in 4th grade. I would pretend to put fingers down and not even blow because I was too scared I would play it wrong. From that point on I never touched them again until I was student teaching and my cooperating teacher suggested I teach the recorder unit. I became full of fear and told her I hadn't played one since 4th grade and shared with her what my experience was with it in 4th grade. She encouraged me to try it out in the "safe" student teaching environment where she would be there and I could ask her for help. I did not student teach in a Kodaly classroom, but I can say that recorders were actually my favorite part of student teaching. I was so proud of my students' growth and success as well as my own. I still use recorders in my classroom, but it is still an evolving thing and every year I do it a bit different. I would encourage you to reflect upon your recorder experience and complete the survey at the link below. Zoltán Kodály believed, "To teach a child an instrument without first giving him preparatory training and without developing singing, reading and dictating to the highest level along with the playing is to build upon sand.” Most Kodály programs emphasize this “singing first” approach. Many general music educators also use the soprano recorder in their classrooms. Whether or not you use the soprano recorder in your Kodály-inspired classroom, please considering spending a few minutes contributing to our profession by completing a short survey. Janell Bjorklund is completing this research project investigating the use of soprano recorder in Kodály-inspired classrooms as part of her degree requirements at DePaul University. Janell earned her Kodály certification from Southern Methodist University/Plano ISD training program in summer 2012 and is now a board member of the Chicago Area Kodály Educators. Few quantitative research studies exist regarding the use of classroom instruments, including the soprano recorder, in Kodály-inspired classrooms. It is possible that this study will reveal some commonalities among Kodály-inspired teachers who use the recorder in their classroom. This study could be an impetus for the creation of future professional development sessions and the production and distribution of materials. Please take a few moments to complete the survey. Your time is greatly appreciated! Was the information from this survey ever synthesized and published?